The Mouravieff-Apostol house and Museum, restored by a descendent of its pre-revolutionary, aristocratic owner. President Vladimir Putin said last week that returning a Jewish book collection confiscated after the Bolshevik Revolution was impossible because it would open a “Pandora’s box” of claims on such property. “[If Russia] starts satisfying these sorts of claims, there would be no end to them and no telling what the consequences might be,” Putin said at the vast new Jewish Museum and Tolerance Center in Moscow. But some formerly communist countries have passed laws voluntarily giving back seized assets, and observers note that Russia already opened this box by returning properties to the Russian Orthodox Church. The Schneerson Library of thousands of religious tomes and manuscripts, which Putin proposed placing in the Jewish museum in Moscow, is among scores of cultural artifacts claimed by descendants of their former owners. The Soviet government appropriated huge amounts of property after the 1917 revolution, including factories, banks and assets of the Russian Orthodox Church, and withdrew from Germany after World War II with trucks full of war booty. One of the most prominent assets in Russia to be claimed by a foreign government is a collection of gold known as Priam’s Treasure, discovered by German archaeologist Heinrich Schliemann in the 1870s on what he thought was the site of ancient Troy. The collection of Trojan gold headbands, earrings and other jewelry was pilfered in 1945 by the Red Army from a bunker under the Berlin Zoo. Certain items from the treasure, including the Large Diadem, a headband made of shimmering gold leaf, are on display at the Pushkin Museum of Fine Arts. According to the terms of a 1990 treaty, Russia was supposed to return all the art and artifacts the Soviet Union took from Germany, including Priam’s Treasure, but it hasn’t done so. The Pushkin Museum and the State Hermitage Museum in St. Petersburg are also home to a valuable set of impressionist paintings claimed by someone else. Art collectors Mikhail and Ivan Morozov put together the collection, which includes works by French impressionists Claude Monet, Pierre-Auguste Renoir and Alfred Sisley, among others. Descendants of the Morozov family have claimed the paintings as their rightful property. Unlike Russia, certain central and eastern European nations have adopted laws stipulating the return of nationalized properties to their original owners. Some Russian pundits believe that Russia should now follow suit, but they warn of the difficulties involved. Alexei Malashenko, of the Carnegie Moscow Center, said he thinks such a move would strengthen the country’s reputation. Others point to the fact that Russian leaders, including Putin, have over the past 20 years ordered the return of highly valuable properties to the Russian Orthodox Church. In 2008, Putin transferred several Christian relics from Moscow Kremlin museums, including a fragment of the holy robe of Jesus, to the church. These artifacts once belonged to the Russian imperial family. Current descendants of the Romanovs have no claims over their properties in Russia and “would only be happy” if the relics that had belonged to them would benefit worshippers, said Alexander Zakatov, director of the chancellery of Grand Duchess Maria Vladimirovna, head of the Imperial Russian House. Unlike the Romanov dynasty, museum experts and art critics have not always been so supportive of these transfers. In 2008, a request by Patriarch Alexy II that Andrei Rublyov’s famous Holy Trinity icon, housed in the State Tretyakov Gallery, be allowed to travel to Sergiyev Posad for a holiday service was rejected after vehement public opposition. Art experts also resisted but could not prevent the 2009 transfer of the 14th-century Toropets icon of the Virgin Mary from the Russian Museum in St. Petersburg to a newly built church in an elite gated community in the Moscow region. In 2010, the Novodevichy Convent, one of three UNESCO World Heritage Sites in Moscow, was returned to the church. With the recent rise in pro-church sentiment among the Russian political elite, the restitution process seems to have accelerated. A 2010 law stipulates the return of all real estate seized from religious organizations in Soviet times and applies to religious hospitals, schools and residential properties but not museum pieces. The law has led to some unusual results. In the Kaliningrad region, which belonged to Germany prior to 1945, Protestant and Catholic buildings were transferred to the Russian Orthodox Church. Some potential claimants of Russian property are not waiting for the legal framework to change in their favor. Swiss financier Christopher Mouravieff-Apostol, a descendant of one of the most prominent pre-revolutionary aristocratic Russian families, restored his family’s former mansion in Moscow at his own expense. He began the project in 2001 with grim prospects for the run-down property and rent of several million rubles a year. But now, the 19th-century building, at 23/9 Staraya Basmannaya Ulitsa, is leased to him at a rate of just one ruble per square meter under a program started by Mayor Sergei Sobyanin to encourage restoration of historic monuments. 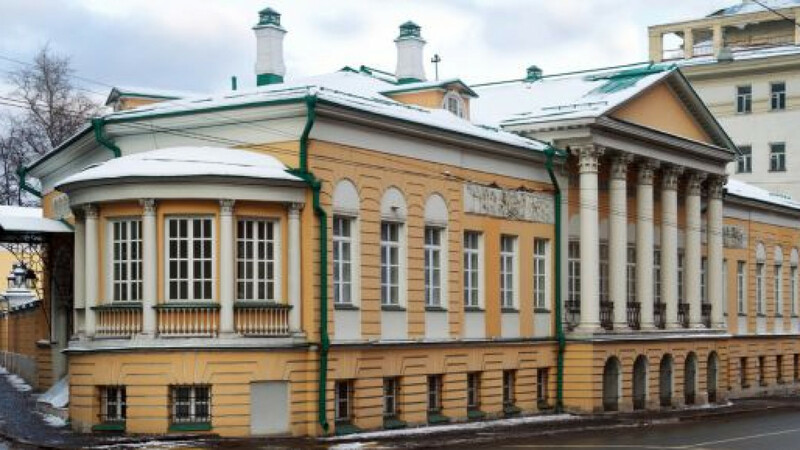 The mansion, which is set to become a Decembrists museum and gallery, represents the only case in which a descendant of a Russian noble came to Russia to restore his family’s former property, museum director Tatyana Savelyeva said. “The state had nothing to do with it, and it was only Christopher’s good will that allowed one of the best Moscow mansions to be preserved,” Savelyeva said.